SHUTi uses the established CBT techniques of Dr. Charles Morin, an international authority in the field of sleep medicine. Due to the small number of certified behavioral sleep therapists available, CBT--the preferred solution for insomnia--has been limited in use. SHUTi uses the internet and technology to change that. Backed by years of clinical studies conducted at the University of Virginia Health System, SHUTi results have been confirmed by recognized sleep scientists and published in leading research journals. This program has been proven to significantly improve sleep, without pills, side effects or changes to your current medications. Whether your chronic insomnia is a primary issue or a result of other medical or health issues, you may benefit from SHUTi. It has been tested in multiple NIH-funded research trials and scientifically validated to provide lasting reductions in Insomnia Severity. After using SHUTi, 73% of trial participants no longer met the criteria for insomnia. SHUTi research received extensive coverage in The New York Times, The Wall Street Journal, USA Today, Good Morning America, CBS Health News and National Public Radio. Now available to consumers and health care providers, SHUTi delivers web-based therapy for insomnia. How does Santa Monica Sleep Disorders Center help with my insomnia? SHUTi, an internet-based cognitive behavior therap for insomnia program is available through Santa Monica Sleep Disorders Center. While this online program may be used effectively by itself, there are some patients who might benefit from additional help (for example, to manage or to come off of sleeping pills, or to deal with other sleep issues that migh co-exist with and/or contribute to their insomnia). Therefore, please discuss your specific situation with your doctor (or if you would like, one our our Sleep Specialists) if you have additional sleep concerns, or if you have questions regarding whether SHUTi is right for you. SHUTi works with you to obtain the restful sleep you want. With our tools, you can stop worrying that you will open your eyes too soon or won't be able to get to sleep. 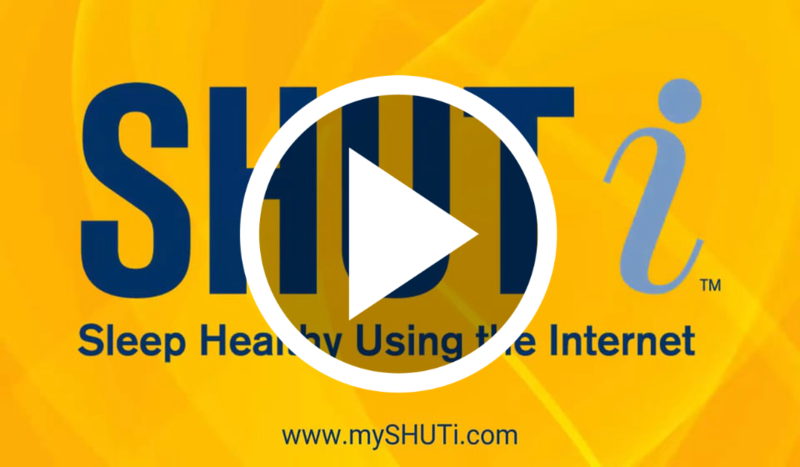 Watch to learn how SHUTi works by clicking on the image below. How do I start using SHUTi? SHUTi includes six engaging interactive learning modules, each designed to be similar to a highly effective weekly session with a face-to-face sleep therapist -- but from the privacy and convenience of home. The program is available for an affordable one-time subscription fee. You may complete the program in as little as 6 weeks, or based on your schedule, continue to use the program and review materials for up to a full 16 weeks. "I've always been a poor sleeper. I'd never really thought about doing anything about it, but then you just get more and more worried each night about you're going to sleep. After using SHUTi, I'm sleeping a lot better now. And I'm 100%confident that even if I have one bad night, I can get back to my sleep patterns. " "I was an appallingly poor, erratic sleeper who suffered from sleep issues for more than 20 years. I tried many things before to solve my insomnia. I decided to try SHUTi because it was innovative and backed by credible scientific research. Now, I get restful sleep and it's rare for me to have a sleepless night. And I'm confident now that I can manage my sleep issues." Call our office at 310-464-1843 or request a consultation.